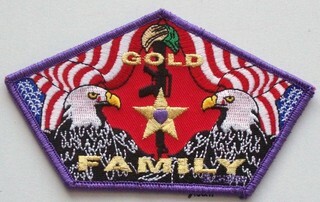 GOLD STAR FAMILY PATCH TO HONOR ALL VETERANS WHO HAVE GIVEN EVERYTHING FOR OUR FREEDOM. THE MEMORIAL CROSS HAS AN M-1 HELMET AND A KEVLAR HELMET TO HONOR THOSE FAMILIES WHO HAVE LOST LOVED ONES FROM THE MORE RECENT WARS. THE TWO MOST SIGNIFICANT PARTS ARE OUR COUNTRY'S SYMBOLS OF FREEDOM. THE AMERICAN FLAG DRAPES BOTH SIDES OF THE DESIGN. THE TEARDROP FROM THE EAGLES EYE'S ARE THE BLOOD SHED, AND THE PURPLE HEART IN THE GOLD STAR, AS WELL AS THE PURPLE BODER TO HONOR THE WOUNDS RECIEVED. THE PATCH IS IN THE SHAPE OF THE PENTAGON, TO HONOR THOSE LOST IN THE PENTAGON ON 9/11. WE ARE VERY PROUD OF THIS DESIGN BECAUSE OF WHAT IT REPRESENTS.